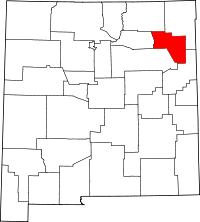 Harding County is unique in that its county seat, the small town of Mosquero, actually stretches into neighboring San Miguel County, albeit only a small amount. Harding also has the distinction of being the least populated county in the entire state with only about 700 residents as of 2010. The County Clerk, who serves as the Recorder of the county among other duties, is located at 35 Pine Street in Mosquero. All records on file there, including property and marriage records, are part of the public record and are available for research. The New Mexico Genealogical Society also provides a large number of research points and resources, including a listing of Catholic Churches in the area and the records they have on file. The State Department of Health acts as the primary official source of birth and death records, and has both on file dating from 1919 to the present. Note: No vital statistic records - see state records section.